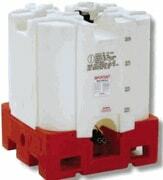 We offer a wide variety of IBC and Tote tanks. We offer all poly units and totes with steel cages. The IBCs or Intermediate Bulk Containers are lightweight, durable, and corrosion resistant for your liquid handling needs. They are ideal for hazardous and non-hazardous liquids. 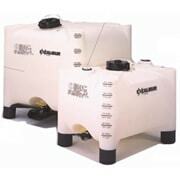 Sizes range from 120 gallons to 550 gallons. The IBCs and totes come with a top opening, 2″ drain with valve, and are forkliftable. Most of the IBCs are stackable. The IBCs and totes are DOT/UN approved. Please contact our sales staff for questions or pricing. HDPE inner storage tank with galvanized steel support and skid. Each tank is DOT/UN approved meeting spec 31HA1/Y. Each tote has 4 way forklift entry. 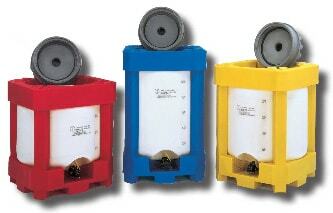 Each tote tank comes with a 6″ top fill port and a 2″ drain valve. Our totes are approved for filling products of a maximum denisty of 1.9. Totes can be stacked up to 4 high while empty. Our 275 and 330 totes are FDA approved which makes them safe for food products. Please contact our sales staff regarding any questions you might have regarding the tote tanks. Additional discounts are offered for large qty orders. 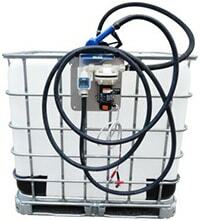 We offer DEF tote Transfer Systems for our 275 and 330 gallon caged totes. The system includes a 275 or 330 gallon caged tote, 12 volt or 120 volt heavy duty pump, digital flow meter, automatic stainless steel nozzle, 20 ft of delivery hose, suction hose, and a 6.5 minute automatic shut-off. We ship our units assemblied. We can also sell the pump system without the tote. Please contact our sales staff for pricing. 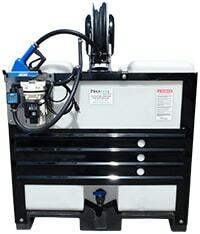 Our 300 gallon Heavy Duty Tote w/ DEF Transfer System with Hose Reel is a unit that last you years. The tank is heavy duty plastic with a steel frame that adds extra protection and support. 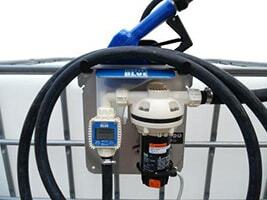 These systems come with a 120 Volt or 12 Volt transfer pump, hose reel, automatic nozzle, digital flow meter, and drain. This unit is shipped assemblied. Contact our sales staff for pricing. Standard IBCs are lightweight, durable, and corrosion resistant for your liquid handling needs. 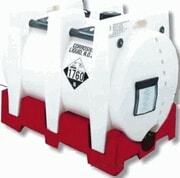 They are ideal for hazardous and non-hazardous liquids. Sizes range from 120 gallons to 330 gallons. The IBCs come with a top opening, 2″ drain with valve, and are forkliftable. IBCs are stackable. The IBCs are built with 1/2″ thick HDPE plastic. 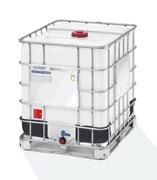 Premium IBCs are lightweight, durable, and corrosion resistant for your liquid handling needs. They are ideal for hazardous and non-hazardous liquids. Sizes range from 120 gallons to 330 gallons. The IBCs come with a top opening, 2″ drain with valve, and are forkliftable. IBCs are stackable. The IBCs are built with 1/2″ thick HDPE plastic. Standard Ultratainer IBCs are lightweight, durable, and corrosion resistant for your liquid handling needs. 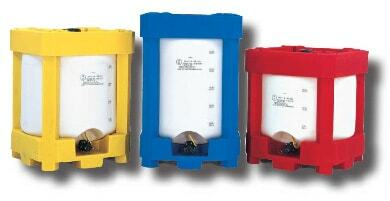 They are ideal for hazardous and non-hazardous liquids. Sizes range from 220 gallons to 330 gallons. 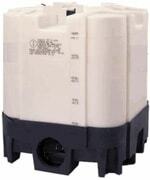 The IBCs come with a 6″ top opening, 2″ drain with valve, and are forkliftable. IBCs are stackable. Wide Mouth Ultratainer IBCs are lightweight, durable, and corrosion resistant for your liquid handling needs. They are ideal for hazardous and non-hazardous liquids. Sizes range from 220 gallons to 330 gallons. The IBCs come with a 22″ top opening, 2″ drain with valve, and are forkliftable. IBCs are stackable. Versatile and lightweight, the industry’s largest poly IBC system offers dependable transportation of bulk chemicals with reduced shipping and handling costs. Lower packaging and shipping costs can boost the profitability of high volume, low margin commodity chemical transportation. Megatainer’s large, versatile and lightweight portable tank design allows almost any shipper to transport bulk liquids more cost effectively without jeopardizing safety or the environment. Megatainer is the industry’s largest polyethylene IBC that’s suitable for both hazardous and non-hazardous liquids.